OOTD - Little Black Dress for Summer | La Petite Noob | A Toronto-Based Fashion and Lifestyle Blog. I know that we're officially into the summer months now, and should be embracing the season with a colourful wardrobe, but there's something to be said for a little black dress - even in the warmer months! This Aritzia Bennett dress is one of my favourites, and I especially like wearing it in the summer for nights out. To say that I've worn this dress to death is an understatement, so I try to change up my accessories to make it look fresh and new every time. Enter this gorgeous statement necklace from Happiness Boutique. I love how the silver of the necklace is so striking against the black, and adding a big floppy hat puts me right in my comfort zone. This gorgeous necklace from Happiness Boutique is completely unlike anything that I have in my collection already. Typically I go for gold, but I'm seriously loving how crisp and casual silver looks, especially paired with black. I love shopping at online boutiques that offer free worldwide shipping, this is so helpful for us Canadian gals! I can't wait to wear this baby with a super-simple outfit to take it up a notch. Are you guys feeling the black dress for summer? How do you use statement jewelry? Let me know! Loving this look!! You look gorgeous, as always. I am totally trending black shades on my post today too. I love the dress on you though and the necklace is lovely. I definitely have an obsession for statement necklaces.I mean, how can you not? Thanks Eleni - yes, neutral tones all the way! I don't usually wear statement necklaces, but when I do I like them to be huge and unique like this one! I love everything about this outfit! 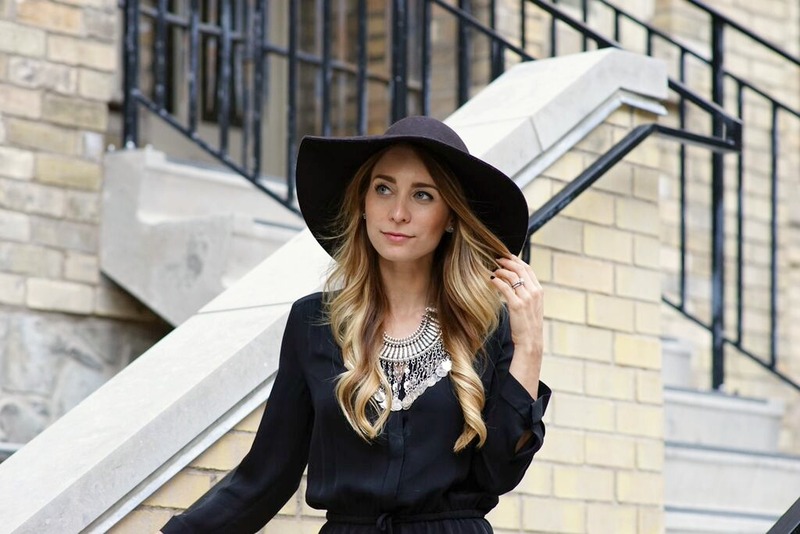 That floppy hat gives your look a fun retro vibe and that statement necklace is gorgeous! I also love the fun touch that the animal print flats add to your outfit. Thanks Helen! I definitely fall back on the leopard flats with most outfits, I love the fun pattern that they add!